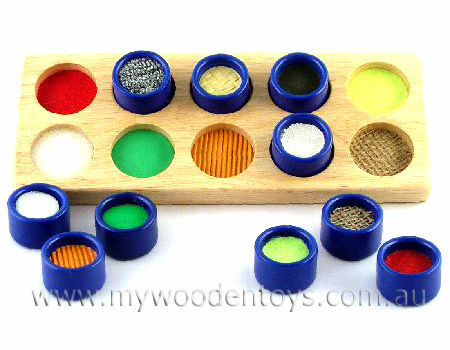 Wooden Toy Touch & Match is soft and scratchy, ribbed and smooth this wooden tray has 14 different surfaces to discover. Touch and feel is a sensory game. Young children will enjoy the experience of feeling and matching the different materials. Older children can try and match the right cup in the right spot in the tray whilst blindfolded! Cups and tray are a lovely quality wood. Size: 27cm Long 11cm Wide. Material: Wood and 14 different materials in the pots. We like this because: "All the surfaces feel so different it's irresistable." Dear Douglas, I have purchased the little bell rattles for the boys and they loved them, so am getting some bigger toys this time. I have been very pleased with your service and your products i am sure i will return to your site again, and again,Thank you.